This place is magic. When I was young, the road rippled like a Willy-Wonka roller-coaster and my dad–despite the oppressive fair traffic–would turn the car around at the fairgrounds and drive the whole distance again just to give me another chance to go: “WhEEEE!!”. Today the walk from the parking lot to the fair is through a wide field and a forested tunnel; you can almost hear the gnomes and fairies muttering about all the tourist traffic overhead. 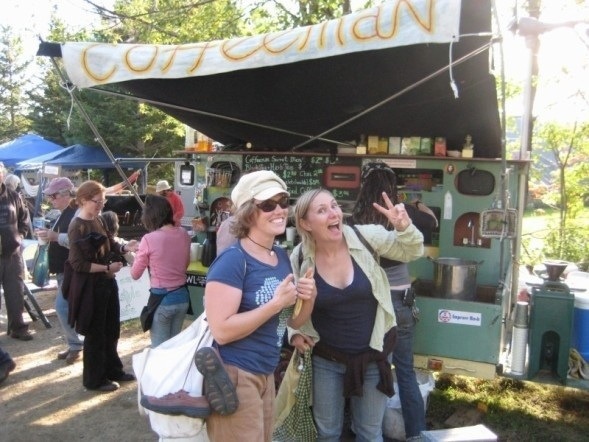 There’s always the Coffee Man outside the gates, a holdover from the days where organic purists ruled that absolutely no mind-altering substances be allowed on the fairgrounds–even caffeine–and early fairgoers resorted to chugging their morning fix outside the gates. Today there’s organic coffee vendors inside, but the Coffee Man abides. He’s an institution. There’s all my old favorites: the sheep dog demonstrations and the Harry S. Truman manure toss, the organic french fries, the strawberry puffs, and scrapple. There’s picking out your favorite apple from all the orchard vendors, and sipping fresh hot cider. In our modern days of legal liability, gone are the tipsy-ladder that flips you off into a pile of hay before you can ring the bell the top and the area where kids can learn to walk on stilts, but there’s still the face painting and the kids’ garden vegetable parade (kids in veggie costumes! See the garden slug dance!). There’s still the intently earnest folk singers and fiddlers, and these days they have been joined by African drumming groups and steel drum bands and a new rockingly indescribable genre called “Mid-Atlantic-Indie-Grass-Acoustic.” Finally there are the tents and tents of artisans–potters, carvers, t-shirts, silversmiths, and knitters that draw shoppers from all over the state. Our little fair has grown and now three rainy days on the wrong weekend in September can change the economic forecast for the entire state. My mom has always been an organic farmer and a member of MOFGA (Maine Organic Farmers and Growers Association), back before I can remember. I recall the days when the fair sold rototillers, the oxen-pull drew farmers from miles around, and the Yankee farmers and the unwashed hippies stiffly rubbed elbows. As farming fades as a profession in the United States, the Common Ground fair is a gathering of those who are working to save the old ways combined with the young the “homesteaders” who are trying to go back to the land as a way to save our environment and local economy. Same story over the years, different titles. I never understood why Mom wanted to sit through all those boring lectures about organic gardening and herbalism–“Moooommmm, can I go visit the llamas now? ?” This year I was surprised to observe myself pulling up a chair (or bale of hay) at “Buying an Antique Tractor” and “The Holistic Orchard” and not just listening intently but taking notes. Suddenly, I’m the young farmer with a lot to learn and looking for books on upping milk production and raising poultry with farm resources. Funny how we grow up to be versions of our parents. Just my farm is in Brazil and I worry not about insulating for the cold of winter but the heat of summer. Dear speaker, don’t look at me like that, no, we really don’t have many natural predators (unless of course the chickens get too close to the pond with the alligator), but can you tell me how to keep them free range–we want them to keep eating the scorpions you see–but still coach them into tilling your crops? (the answer involved a chicken coop on wheels–if the in-laws thought I was crazy before, hang on…) But farming is farming and some of the heritage techniques they’re teaching those homesteaders are ones that we’re still using in Brazil and have been doing for generations. New generation. Same story, different titles. Is this what it looks like, in our ever-shrinking world? Will farming be global as farmers in Maine compare notes with farmers in third world countries? What can we learn from each other? I wonder if someday my kids will grow up coming to the Common Ground with their gramma? I hope so; I hope this is the first of many like this. I look forward to being a bridge between these worlds old and new, foreign and familiar. Thanks. Keep up the good word.